It finally happened. Last Sunday we got about 7 inches of snow. The boys were so excited. So was Scooter, our border collie. 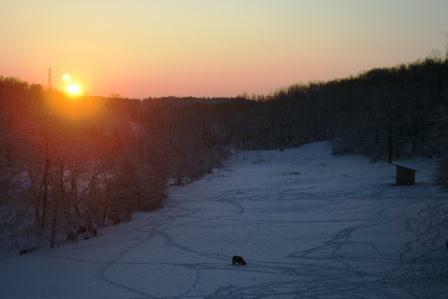 The sun came up over our big pasture and I could see where our horses left tracks all through the snow. Nothing says Rural Thursday like a tractor covered in snow, right? Cort and Reid liked watching it snow, but they were a little less excited once we actually got outside. They didn't want to venture out into it. Pierce enjoyed eating snow. He ate lots and lots of snow. I suspect he's well hydrated for the next week or so. I hope you'll link up with Rural Thursday, hosted by A Rural Journal and I. You can link up just about anything that suits a rural mindset - recipes, nature pics, your pets, crafts, etc. Just grab the code below the button, add it to your post, and then come back and add your actual url to the link up. Please be sure to visit at least 5 other blogs and leave them some comment love. I mean, look at that first word? This is not because my picture is blurry - that's how it actually looked! What is that supposed to be? Please folks, turn your comment verification off. Comment moderation is an excellent substitute, and the spam catcher does a great job catching spam anyhow. In over 2 years of blogging, I've only encountered one or two spams that my spam catcher didn't pull out for me. You live in such a beautiful area, I am very jealous! The new comment verification is awfu,l and what's up with the two words? I love the picture of Scooter in mid-air, and the kids!! Is this your house? Oh I love your snow photos! Your farm is beautiful all fluffied up by the snow! Cort and Reid are so cute standing beside the house- not quite ready to venture out. I think Pierce and Scooter had the best time of all. I turned my comment verification off, and the blogger has been catching the spams,- which make me happy. Your home is so beautiful, Lisa. WooHoo on your snow! 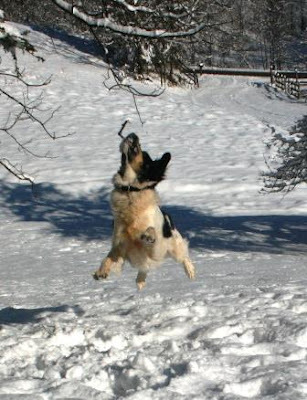 You got a great action shot of your dog. So fun. I love the twins...just not quiet sure what to do. Cort sure did though. :) GREAT tractor shot! scooter looks as excited as ozzy was! the boys look adorable ready for the snow! 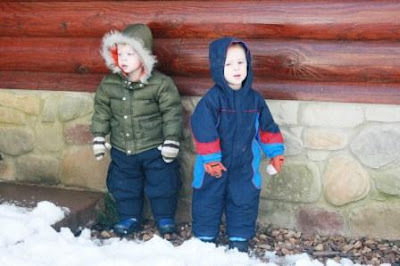 I love the picture of the twins standing just outside the snow line! And your house looks very similar to ours. 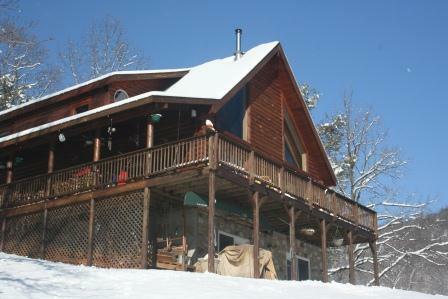 We live in a chalet-style home with a second level wrap porch. I'll have to get a picture sometime so you can see. So jealous that you have horses!! I am so jealous! We have had sunshine and head colds here. The new commenting system is giving me a headache. Boy he was jumping for joy wasn't he? Looks like a great time you all had. O I love the tractor!!! Scooter was one happy dog! And I'm glad Pierce enjoyed the snow just as much. One of these winters, all three boys will be out there having fun, I'm sure. Love that snow! We bought our girls snow suits for this winter, and we've used them a total of two times. Argh! Who knew it was going to be such a mild winter?! Anyway---AMEN to turning the word verification off! So annoying! Love your home, Lisa... my husband's dream Vermont home, you have there. Perhaps a tour sometime? 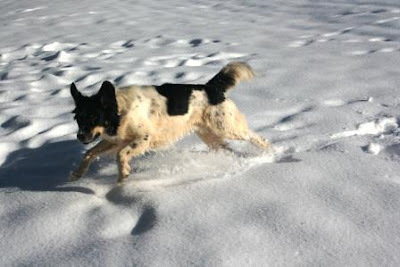 Great pics of your dog having fun in the snow. I've posted a 'word verification free blog' at the top of my blog. Just so people know I don't participate in it. Love the snow shots! Cort and Reid look like little Michelin Men all bundled up. LOL Crazy boys. Nothing beats a snow day! That's awesome! I love the picture of the dog. Ours loves snow too. It must be the Huskey in her. We are getting some snow today but not as much as you. the snow looks great! your house does, too! We don't get snow where I live...but when it gets super cold we get ice...brrr! As for the comment verification, I will try twice then I leave. Those words are sometimes impossible. The snow pics are great & Scooter is definitely a happy pooch! LoL! When I ran Barn Charm Monday-Wed, I encountered 4 that still had word verif on & I asked them all very nicely to please consider turning it off... 2 have, but 2 haven't & I can't make em, but I won't comment on their blog anymore, either, I just don't have the time to struggle & fight w/ word verif... I guess people don't know how to change it, so they think it'll go away? Who knows! Snow is so beautiful but why does it have to be so cold? yes I know if it wasn't cold it would be rain! Lovely photos today. Have fun in the snow! It finally melted here, but it seems the cold is here to stay! Thank you for the note on word verification. It drives me batty! Snow!!! Whooo Hoooo..... I am glad I am in Vegas Baby!! Snow is okay... but I have been there done that once this year already. You guys got snow in a big way! Fun! 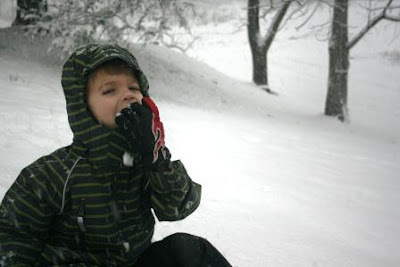 I remember eating snow as a kid-I actually thought it tasted really good. More than just like frozen water! I'm going to try to link up later today-and I totally agree about word verification! It has become a total pain. Last week I was supposed to type the math symbol for pi! ???? Just lovely!!! 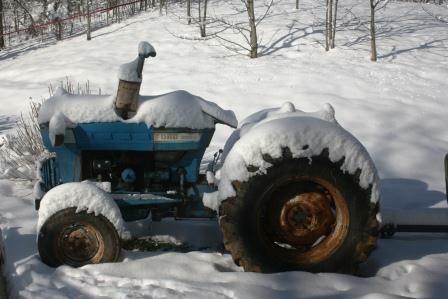 A fresh blanket of snow makes everything beautiful...yes, even tractors!! I really love the sunrise shot with the horse tracks. You must have taken that one from your deck...awesome house! You are very lucky then. I use wordpress and akismet, its automatic spam checker catches hundreds of spams per day, but without the captcha (which is nowhere near as bad as blogger) I would get dozens per day that got through and it was a pain. Each and every one of these photos is a great memory. It is beautiful where you live. I also recently turned off Blogger's word verification. but didn't realize immediately that the format had changed. It's not easy to use now. if you are using the new Blogger format. Love the snow photos....especially Scooter! He looks so extremely happy. What a nice homestead you have. Enjoyed all the photos. God bless. Lost in the snow, the tractor is waiting for spring to come. Beautiful pictures. Have a nice week. Greetings from Romania. Wonderful photo's, Lisa. I always love seeing the boys. What delight! I think your dog likes snow better than your boys! You certainly did get snow; my son would LOVE us to have just a touch, but hey we were at 74 today so not certain if that will happen! there's just nothing like a little snow and some cute little ones to enjoy it with!! p.s. my mom always said snow had radioactive waves in it and we were NOT to eat it. We did anyway. Beautiful photos! We got snow Sunday where we live, in Viginia, also, and we were so excited, like two kids! But Monday was back up to spring-like temperatures, so it quickly went away. We enjoyed it while it lasted! Yes, the new captcha is annoying. I will turn mine off and see what happens. So frosty and pretty! Enjoy! I love that tractor picture. And, the comment verification is SOOO annoying!!! Oh, lucky! We haven't really gotten any snow this year. Just a dusting a couple weeks ago. We've gotten a little freezing rain, but mostly just mud. Today it's 72. It's suppose to be back in the 50s by Monday. Great picture of your collie dog! Fun snow day... we really havent had any snow here this year, yesterday was nice, sunny in the 70s, today cold, windy & while out doin animals chores I seen teeny tiny hard snowballs coming down for a sec. Aw! Snow! I haven't seen that beautiful white stuff in almost a year! lol We didn't get NOTHING here! lol It's the year without snow at my neck of the woods! I agree totally with you on the word verification! Preach on girl! I love the pictures of Scooter. I live in Southern California and I always wonder if my dog would enjoy snow or not. I've never used word verification; much prefer comment moderation. It reminds me when people leave a comment; I try to respond quickly to the notes folks leave. I did away with my verification. It was horrible. I love your snow pics, and I love your dog. I know I already commented on that pic on twitter, but I just love it! The comment verification is driving me nuts. I thought my eyes were going bad! Deaglan eats snow all the time too only we live in the city where it's not good eating snow.